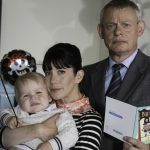 Home » Drama » Portwenn surgery reopens for business as ‘Doc Martin’ returns to ITV for S8! Thankfully for non-residents of Portwenn, Dr. Martin Ellingham isn’t done insulting his patients just yet. Everyone’s favorite curmudgeonly village physician with an ill-timed phobia for blood is back for the next set of eight programs that will make up series 8 of Doc Martin. The new series returns Wednesday, 20 September at 9p on ITV with a broadcast on public television stations in the U.S. not far behind, tentatively, in early 2018. Doc Martin S8 returns to ITV on Wednesday, 20 September at 9p. Public television in early 2018, hopefully.